Kitty's keeping secrets. Like how she's struggling to cope with her mum's illness. And how she's falling for the girl with the purpley-red hair... A fun film competition with her friends Sunny and Hannah seems like the perfect distraction. But then Dylan wants to be more than Kitty's secret. Is Kitty ready to let her two worlds meet or will she risk losing Dylan forever? I'm already a huge fan of Keris' books and I think she's one to watch in the YA genre, so I was really excited when my copy of Starring Kitty arrived for collection at my local Waterstones. This is a sweet story of first love and finding your identity. 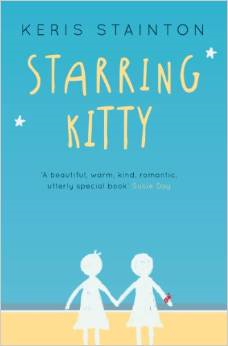 Kitty is a typical teen girl with typical friends and to those outside, her life is pretty normal. But Kitty has secrets. She has a Mum who is ill and is struggling to cope with not being able to be there for her girls. Kitty has to help out more at home and her Dad has to work long hours in order to make ends meet. At 15, that's a lot to deal with. On top of that, Kitty is falling in love, which is great, except that Dylan is a girl who lives next door to her Grandma. Dylan and Kitty are adorable together! They're like any other young couple and are so sweet as they become closer. I felt really drawn in to their story and was rooting for them. Kitty's friends, Sunny and Hannah are great too! Keris has a wonderful way of creating characters that you really feel for and that you genuinely care about. I think that's what makes her such a fantastic author in this genre. The girls worked well together on their film project and were just so real and normal, it makes a nice change from all the vampires and werewolves and supernatural YA books that are around now. It was just lovely and NORMAL! The setting for this novel is a cosy little seaside town (I want to say Lytham St Anne's?) and I could just picture it all as the story progressed. I could feel the sun beaming down as we walked along the prom, I could see the beautiful roses in the park and I could smell the sea air. Just perfect and idyllic! I loved everything about this book and can't wait for the follow on! Keris, you continue to astound me with your wonderful stories. I always think your last book was your best and I am always proven wrong as you get better with each new release.